Blake Shelton hit the stage twice at Sunday's 2018 People's Choice Awards, once for his accomplishments as a country star and once for his accomplishments as a judge on NBC's The Voice. 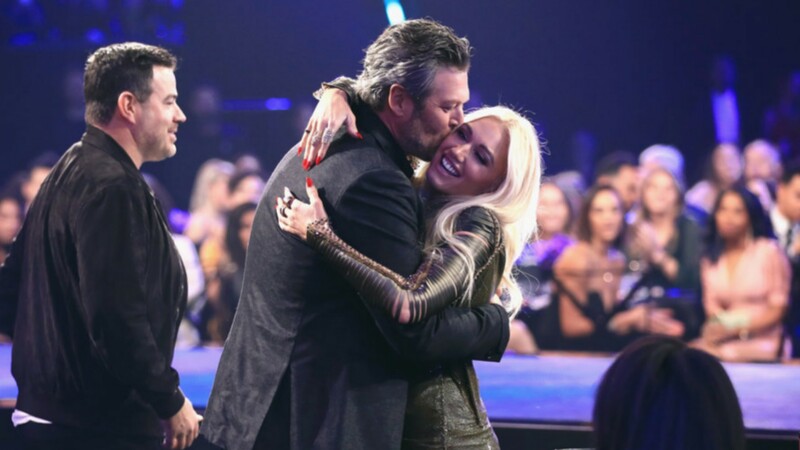 When Shelton headed up with Carson Daly to accept their award for competition show of 2018 for The Voice, he and girlfriend Gwen Stefani had a super-cute moment thanks to Daly calling her up onstage. In the clip from the show, after Daly began the duo's acceptance speech, including shoutouts to the firefighters in California and U.S. military veterans, he said, "And we have our own coach, Gwen Stefani — I want to thank Gwen Stefani before Blake does. Thank you, Gwen, and all of our coaches on The Voice." Shelton then took the lead and pointed to where Stefani was sitting in the audience. “All-time favorite coach, right there, Gwen Stefani. I love her,” he said. Daly invited Stefani to the stage, which she initially refused when the camera cut to her seat. With encouragement from Daly chanting, "Gwen! Gwen! Gwen!" and cheers from the audience, she made her way to the stage and shared a quick embrace with Shelton. “Who would’ve thought that this country artist could land one of my oldest friends in the music business?” Daly joked. “Oh, my God, I’m so excited to be with Blake Shelton!” Stefani said when Daly asked her to say something. She added, "Thank you so much." Then she pushed the two men toward the microphone and stepped back, clearly wanting them to wrap things up — which Daly did by cracking another joke about the couple. “They’re gonna get a room," Daly said. After the broadcast, Stefani shared a snap of the three of them onstage, writing, "Congrats @blakeshelton love u @carsondaly." She also shared photos from the red carpet as well as a sweet group photo that again included Daly. Since Shelton and Stefani met on The Voice, it's pretty adorable they got to share this moment during the PCAs. Daly also clearly embraced his role as the third wheel, which added a comical air to the whole exchange.